The United Arab Emirates (UAE) has long looked to the Organisation for Economic Co-operation and Development(OECD), not its Gulf neighbours, as a target peer group. The Index shows that it has reached this target, making the biggest absolute prosperity gain over the past decade to sit alongside OECD member Israel at the top of MENA’s prosperity rankings. Ranking 41st to Israel’s 40th, the UAE’s success has largely been driven by reforms to open and diversify the economy. Now, after almost erasing the gaps in Economic Quality and Business Environment, the UAE has a smaller overall prosperity deficit than any of the other Gulf states. It is not only about the economy, however. Over the past decade, Social Capital in the UAE has risen from 51st to 25th largely as a result of more Emiratis participating in voluntary work in their communities. Small improvement has been made in Governance as measures of government effectiveness and the rule of law rise. The UAE has also improved in Health, rising into the top 30 globally as life expectancy climbs. The country retains an ambitious agenda for national success and has proved that ambition can pay off. Prosperity can rise further yet. Saudi Arabia is the worst performing of the Gulf Co-operation Council (GCC) countries. Besides severe restrictions on Personal Freedom even by Gulf standards, it also faces the region’s weakest performance in Economic Quality and Business Environment. Years of dependency on oil exports have created an economy that is - unlike the UAE’s -undiversified and uncompetitive. Labour force participation is the lowest of any GCC state. 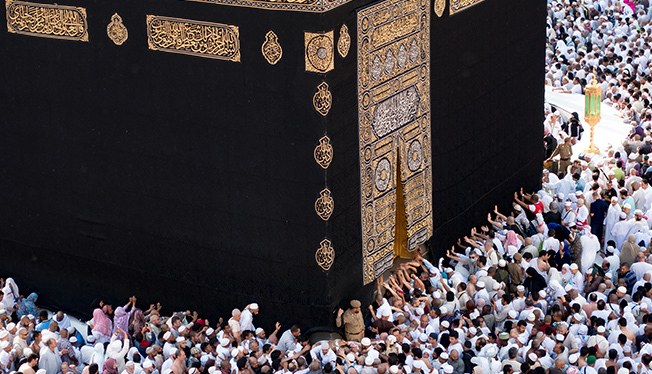 Saudi Arabia faces problems across the board, not just in its economy. It ranks poorly in terms of Safety & Security as well as Education and Health outcomes. Recognising the issues facing the country, the current leadership of the Kingdom has launched “Vision 2030”, a long-term plan for economic diversification and social transformation. The Index shows that such an initiative is desperately needed if prosperity is to rise. Over the past decade, no other region has experienced such devastating effects of war on its prosperity. 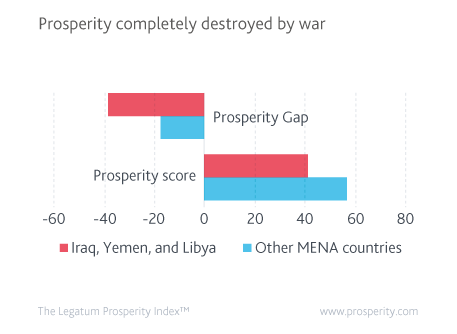 As of 2016, the three least prosperous countries in MENA - Iraq, Yemen, and Libya - are all mired in violent civil war. The near-complete breakdown of prosperity in these countries is stark: war has caused the suspension of most economic activity, health and education have been devastated, and civil society has been dismantled. Yemen, 2016’s least prosperous country, has seen terrorism-related deaths more than treble since 2007, while Libya has seen its rule of law collapse. 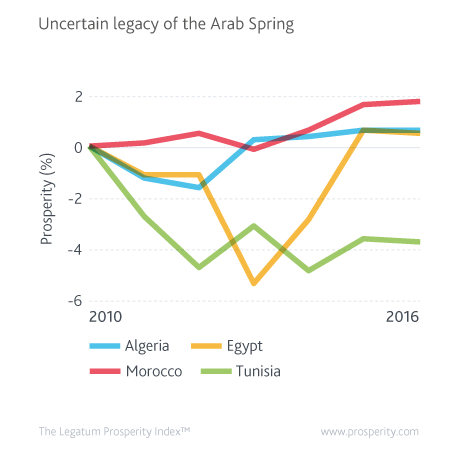 The social movements that swept the Arab world around 2011 have set North African countries on different prosperity trajectories. Five years on, the prosperity legacy of the Arab Spring is both varied and unclear. 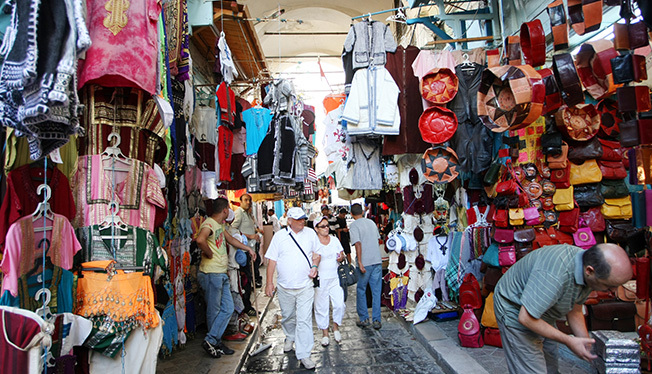 Tunisia’s trajectory has been downwards. While a new constitution and democratic elections saw great progress in Personal Freedom and Governance, IS insurgency has undermined both the country’s security and its heavily tourism-dependent economy. Prosperity has suffered as a consequence.